Which mask is the best against pollution? I can’t really answer that for everyone, as our faces have different sizes and shapes. I’ve recently shared results from three large tests, which unfortunately didn’t review many of the consumer masks I’ve used. But I can now tell you exactly which of those popular masks is perfect for me, and maybe we all can learn a bit from my adventure. Here’s my tale. In my seemingly never-ending quest for the best research on masks, I recently started to correspond with the research team at 3M, and during our conversations they very nicely offered to let me use their TSI Portacount Pro+ machine at their testing lab in Beijing (with no oversight of my results or article). This is the most widely used machine to officially test a mask’s effectiveness on a person’s face, and on a nicely smoggy day (another typically hazardous AQI over 150) I tested nine masks to find out which worked best for my face: three 3M models; Totobobo; Vogmask; Respro Techno; I Can Breathe Honeycomb; Lvdun 绿盾; and a surgical mask. We performed a quantitative fit test called a total leakage test on all nine. This test measures exactly what you and I want to know: the ratio of particles larger than 0.3 microns (PM0.3) inside the mask, compared to the particles outside the mask. To perform each test, you punch a hole in each mask and stick one tube in it and another tube outside. This ratio of outside/inside air is called the Fit Factor, and while a proper “pass” would be a Fit Factor over 100, which means an efficiency of 99%, any Fit Factor over 10, which means efficiency of 90%, is also pretty darn good, and a much more achievable target for real world use. This is also called the workplace protection factor by OSHA in the USA, and is the target for anyone who must wear a similar mask for their job. For me, my goal for success was a Fit Factor over 10, and super success would be Fit Factor over 100. The test itself is easy and only takes ten minutes, using a series of positions, each lasting just over one minute: normal breathing; deep breathing; head turning side to side; head up and down; talking; grimacing; bending up and down; and normal breathing. Before each test, to make sure you have a proper seal on the mask, you do a user seal test, in my case doing a negative pressure test. This quick check actually is something all of us should perform each and every time we put on our masks: you cup your hands on each side of the mask and breathe in quickly. Your mask should cave in a bit from the negative pressure; if it doesn’t, the seal isn’t tight and you need to adjust. There was only one true winner with a Fit Factor over 100, technically “passing” with efficiency far above 99%: the 3M 9332, a disposable which is certified FFP3 in Europe (N99, essentially). With an incredible Fit Factor result of 240 (99.6% efficiency), this was almost too good, as I found it a bit less easy to breathe than with others. But still, on crazy bad pollution days, I think I’ll be using this one. Besides this model, three others passed the threshold Fit Factor over 10 (90% efficiency): the 3M 9501 at 97%; a Vogmask with 95%, and a 3M 9001V at 92%. In the middle, with efficiencies in the 80% range, in order were I Can Breathe’s Honeycomb mask at 87%, then the Respro Techno at 85%, followed by my second attempt with the 3M 9001V at 84%, then Tobobobo at 80%. The worst mask of all was the most popular reusable consumer mask in all of China last year, the Lvdun 绿盾 mask. At only 57% efficiency, this 32 RMB mask was even worse than a 1 RMB surgical mask from my clinic, which did surprisingly not horrible at 63%. Lvdun’s poor results were similar to other poor results from a couple of Chinese consumer group reports that I’ve already discussed in an earlier article. I’m quite astonished that this Lvdun mask is such a good seller in China, and I feel a twinge of anxiety every time I see an adult or child wearing one of these. Don’t forget that every face is different, and many studies have shown that one size does not fit all, unfortunately. So my results don’t mean the same mask will work the same for you. Even the same mask can fit differently on the same person on different attempts, as I demonstrated with the 9001V. For me, I found this testing invaluable and I certainly am much more reassured with what I already knew: the 3M brand is by far the most consistent, evidence-based, internationally proven and researched series of masks for me — and maybe for everyone. Their dozens of models have been fit tested millions of times over the last few decades in workers across the world, and I can’t think of any other mask company which even comes close to their reputation and experience. My everyday mask is now their 9501, which I can grab at any 7-Eleven, only costs 6 RMB, fits flat in my pocket and lasts at least a week. At over 97% effectiveness, on a crazy bad day of PM2.5 concentration of 500 ug/m3, the air inside my mask is around 13 ug/m3 — just within reach of my ideal target of 10. The 3M 9332 would easily get me there. The next time the airpocalypse hits and it starts raining down hellfire, frogs, and PM2.5, I’ll be biking to work as usual, safe and snug inside my mask, wearing my helmet and humming along to Air Supply’s Greatest Hits. Regarding all of the commercial masks popular especially among expats, I honestly was disappointed in their general results for me, none of which were better than 90% — except for Vogmask. Respro’s Techno filter is officially FFP1 in Europe, which means 78% efficiency, and it actually did better than that on my face. But given how much more expensive it is, I certainly wouldn’t consider this a good value for me at all, especially if a 6 RMB mask can get far better protection. It certainly didn’t help that I found it surprisingly uncomfortable. And in general, 78% protection in China just isn’t good enough, and I don’t think anyone in China should consider a mask certified only FFP1 when so many other masks do better than that. Even on an average Beijing day of 90 ug/m3, an FFP1 mask at best would still give you 20 ug/m3, which is still far above my ideal of 10 and under (equivalent to a healthy AQI under 50). I was also a bit disappointed with Totobobo, but the result is fairly consistent with a recent test from the China Consumers Association, which only gave it 3.5 out of 5. I find their manufacturer’s suggestions to custom fit their masks with scissors or boiling water quite onerous and certainly at a disadvantage when many other masks are far more effective right out of the package, requiring no customization, at a far cheaper price. The I Can Breathe Honeycomb mask wasn’t so bad, and is very comfortable, but again there are other masks which do far better and are much cheaper. I Can Breathe also has no official certifications, which I feel is another disadvantage. Vogmask was the only one that did very well, but they still don’t have any official ratings nor any large independent tests, so I would consider this my first second choice — but still a second choice. I suppose for now it would be my first choice for my toddler, but I am definitely uncomfortable relying on only one test result from one 8-year old boy. But at least I know it’s far superior for my toddler than Lvdun’s extra small mask, which in previous independent tests performed dangerously ineffective at only 10% efficiency. I’m starting to think that this entire new industry of pollution masks for consumers should be regulated in order to prevent false health claims, and especially to protect our children from using dangerously ineffective masks. 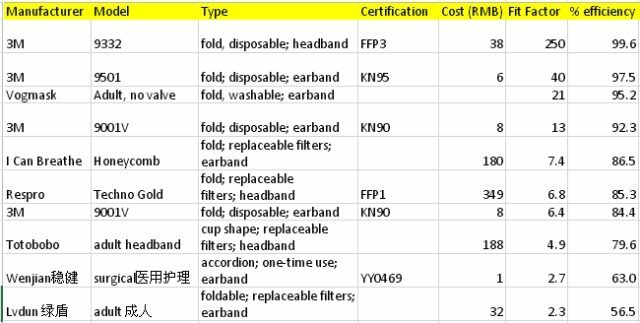 I now find it hard to seriously consider any mask which doesn’t have any official certification (N95 or N99 from USA, FFP2 or FFP3 from Europe, KN95 from China) as well as independent test reviews. I certainly hope that the consumer mask companies continue to nobly rise to the challenges, improve their designs and try to get certifications. In the meantime, I’ll stick with my 3M. Thank you for all your efforts. Scientific results are much better than commercial arguments. I’ve purchases the totobobo masks, and will try them. If I saw your article just few hours ago, I’d definitly buy the 3M mask or the Vogmask. Please continue updating your website, you are saving lives ! We read your comment, and have to fundamentally disagree. The valve on the Techno mask has been designed for industrial applications. This means it is subject to the same tests to that of valved masks that conform to US (N95-99) and European standards P1,2 and 3. The valve must be closed at all times and all orientations unless a positive pressure exists in order for it to open. If the valve is open with no pressure then the body of it has been opened at some point and the diaphragm in it is not seated correctly. Please check your valves by removing them from the filter, placing them one at a time without the fastener, over your mouth and try to inhale as though you were breathing normally, you should not be able to draw a breath. It’s good to hear from Respro again. As you are the technical people at Respro, can you please confirm that your Respro Techno mask is rated FFP1, which technically is 78% efficient (allows 22% leakage)? Hi Nelson, you may be interested in a new review (photo: http://www.51lantian.com/uploads/image/20141110/1415631069.jpg). Although the performance disappointed the reviewer, he did achieved a Fit-factor of 38. For Dr. Cyr, the Fit Factors for Totobobo was only 4.9. A Fit factor of 38 means there is 1 particle leak into the mask for every 38 particles outside. That is equals to 97% efficiency, reaching the performance of 3M 9501 and better than Vogmask in Dr. Cyr’s test. Obviously, as Dr. Cyr explained, the test result only applies to the individual taking the test. It cannot be assume other will achieve the same result. Where you able, when wearing & testing the mask, to guess the results of its testing ? Maybe when wearing it, you were able to notice some air breaches or something. Also, what is the difference between the Activated Charcoal FPP2 filters and the FPP3 filters ? We can find the 3M 9928 (FPP2) which has the Activated Charcoal filters and the 3M 9332+ (FPP3) without the Activated Charcoal filters. Which one is the most suitable for pollution ? I’m so glad I found your blog! I live outside New Delhi, and our air quality is also horrific. I am planning to bring some 3M 9211 masks back with me from my visit to the states. I haven’t seen face masks much in Delhi. I asked at pharmacies, but they are the really thin cheapo ones that do nothing. I was putting a folded up tissue inside of that when I did housework until I could get something better. I’m toying with the idea of bringing some extra 9211 masks to give as Diwali gifts to the bicycle rickshaw drivers in my neighborhood. It is especially bad at that time of year because everyone sets off fireworks. They are poor and barely make ends meet, and are breathing heavily because of all that pedaling exertion. Would be nice if I could afford to get them something more long lasting. That’s very generous of you! I would think any gift would be appreciated, and certainly 3M would be the best choice for value and effectiveness. We Beijingers were quite interested earlier this year at that controversial report saying New Delhi’s pollution was worse than Beijing! Seems there’s quite a lot of denial in India about the severity of the issue. I was in denial about that report myself. In the winter, the air was so dense with smog. I kept telling myself it was just fog, but it wasn’t. Lots of flights were affected at IGI airport. I didn’t know about the AQI last year, but I plan to follow it now. And I have my masks for when they’re needed. Selling face masks would be a smart business idea for a savvy entrepreneur in Delhi. Oh God !! I stay in Kolkata where the AQI is pretty bad but definitely not even close to being on par with New Delhi’s near-smokestack conditions. And conditions ease out dramatically once you’re out of the 10km city centre zone ( or out of the 1km linear north south arterial road influence area ). On a related note, i was surprised at why the cambridgeair N-95 mask wasnt included in this survey. But 3M’s 9332 would probably beat it in terms of efficiency and price both. Have a safe Diwali , if you cant help it. Or get out of the city for a couple of days, if you can. From what I’ve heard, there’s a whisper campaign running amongst the ruling party and the firecrackers merchants to make this a “successful” Diwali. Hi! Thank you for your very informative post! I’m planning to travel to Beijing very soon, and have been researching about these masks. I’ve noticed that counterfeit/fake masks are a huge problem in China as well as many other Asian countries, and I was wondering where will I be able to purchase authentic 3M masks in Beijing as well as the price ranges of these masks. There have been cases where local hospital clinics have used counterfeit masks without knowing and that we can’t guarantee the authenticity of these masks at local stores like 7-eleven in Beijing. I would think 7-11 is a good bet but maybe the best is 3M’s own online store, at 3M.tmall.com. HI Richard. How many times can one 3M 9332 mask be used? I’m wondering if I buy 10 masks, how long will they do me for if I wore one outside while walking 1 hour per-day. I’m moving to Changchun in North-east China and want to buy them before I go as I’m not sure If I’ll be able to buy them when I get there. This is very informative so thank you! I was actually wondering if you knew of another number the 9501 model might be sold under. I am moving to Mongolia and would have liked to buy the 3M 9501 in Canada before leaving but the model number does not seem to exist on 3M Canadian or US store. Any suggestions? thanks for all your information on masks! I have developed mild multiple chemical sensitivity, and so I’m in search of the best mask possible.but since people in my part of the world are still really afraid of mass I need one that is somewhat approachable. 3m just seems too scary for people here especially kids. wondering if you could test the vogmask with the valves.also is there any way you know of that you can buy a single totobobo that would be come untempered from the distributor.friends in the community have had bad like buying masks not directly fromrom the distributor. Because sometimes people add perfume and things. I enjoyed the article and have been perusing through this and other articles you have written. I’m curious as to which mask would be best for running. I’m training for a marathon and would like to have an option to protect myself if the pollution gets nasty outside. Many 3M masks, though, aren’t good for heavy breathing such as I would do while running. For running outside for hours such as a marathon and training, I still can’t think of any better designed masks than 3M, especially with the exhalation valves. I think resistance would be too high both with Vogmask and Totobobo, and certainly Respro isn’t even an N95 in the first place so that’s not a real option. You really need to stick with the most evidence-based masks, and that’s still 3M. What good is better flow on other brands if better flow only means more leaking? thanks for all your wise advises and articles! For us expats in China, they’re pure ambrosia! I’d be really glad if you could answer a quick question: I bought from my local 7/11 a stock of 3M 9021 masks (KN90). The model is without external filter and with earloops. Could you tell me something more about this model? Is it as good as the one you suggested on the range KN90, the 9001V? Sorry, I don’t know about that model, just check their own website 3m.tmall.com. KN90 is the Chinese rating system that it filters 90%, similar to the 9001V I tested which did really well at 92%. I would assume they’d be about the same. I’m British with a mainland Chinese wife. We have a 2 year old son, who recently developed asthma. We are thinking to spend a year in Beijing for work purposes. I’ve found the 3M 9332 mask you recommended on Amazon here in the UK, but it seems to be for adults only. Hi Rob, I think it’s much more important to first protect the 90% of the spaces where your toddler will be living — indoors, especially at home. Good HEPA air purifiers are essential, in my opinion, especially with higher-risk kids such as ones with asthma. Otherwise, for masks, there really is only one brand which would even fit a 2 year old, and that’s Vogmask. Fortunately it is very well made and has done well in the couple of tests I’ve seen (including my own, but not on a child’s face). As to whether or not he will wear it, sorry there’s no good trick for that! At least Vogmasks are comfortable and look fun for kids, which helps a lot. Wonderful to see and read of your foray into individual mask testing with the TSI Portacount Pro+. One thing which I find quite surprising is the difference between the 3M 9501 and the 9001V, which despite sharing the same form factor, produced dramatically different fit factor numbers. Do you attribute this to the normal variation in results that can occur with each test, or is it related to the addition of a valve mechanism on the 9001V?? I own the 9001V, and subjectively it seemed the fit factor would not be very high, but the discrepancy in readings between this and the 9501 is really rather puzzling. Certainly the tri-fold design of the 9332 is a standout, basically an all-new approach to mask design. Hopefully we’ll see it adopted more widely. Its off the chart readings confirm my hunch while wearing it. There is a FFP2 version (similar efficiency to N95) with slightly lower breathing resistance and which costs less. It’s the 9210 model from 3M, and the 9211 (with valve). Why not try the active mask – powered adaptor for N95 mask. See http://www.yihuxi.com or http://www.ecbreathe.com. Much easier to breathe and good protection. Especially for younger users. Likewise there is no respirator certified for use for kids, but kids have been using masks (e.g. 3M’s 3100s or 1860s – they were only certified for use for “workers with small faces” – but most parents think they were for kids). People can’t wait till NIOSH comes up with the appropriate certification methods for them – there is urgency to protect our kids from getting cancer caused by haze. I am in contact with NIOSH to work on coming up with the guidelines for testing such new tech, but for the moment parents would just have to rely on whatever suitable and comfortable products out there. I am interested in this technology for a family member who bikes 40 minutes to work and then home. I checked the ecbreathe link provided here and am very disappointed that there is a fragrance dispenser in this active mask. We are trying to breathe air without particles or added chemicals, which have the potential to cause adverse reactions. The fragrance dispenser is optional – it can be removed or left unused. I’m a female in my 20s and I can’t seem to find any masks that aren’t way too large for my face. I feel like trying kid sizes would be too small…any mask suggestions? Vogmask has 4 sizes so maybe their older child size would fit well. Or get the S (“Small”) version of the 3M masks, but you’d have to order online from 3M. My sister and niece are going to Beijing in December and a friend suggested a face mask and sent me this link. Great resource. Thanks so much for sharing this. In the 3M Aura line are several other models similar to the 9332, such as the 9322 (FFP2 class) and the NIOSH certified 9211. Both are valved. With either the 9322, which is approximately N95 at 94% efficiency, or the 9211, over time the efficiency actually rises, according to a 3M technical specialist, as the filtering material becomes filled. So where a 9322 may have more breathing resistance than the others when new, and then rise to uncomfortable levels, the 9322 and 9211 are a bit easier to breathe through and over time offer increasing – but still acceptable in terms of breathing resistance – efficiency. Do you have experience with either of these models in the Aura line? The 9332 is a magnificent mask and these other versions may offer what could be considered an additional advantage. A new “9211+” which replaced the old 9211 this year, features a more robust braided strap material. The earlier material, a rubber strap identical to the 9332’s, would tend to fail rather quickly – lasting a week or so over daily commutes. I’ve ordered a box of the 9211+ and expect the braided elastic strap to increase the value. The retail price has not risen with this change. It actually appears to be more affordable, and given the excellent fit factor and build quality, who knows yet how long these can be worn…. It’s difficult to believe the efficiency improves as the material becomes filled. Totobobo has shown the exact opposite – the longer you use a filter the less effective it becomes. What would account for 3M masks having the opposite result? Matt, that slight improvement in filtration efficiency is according to 3M. As the material captures particles, the sub-micron sized gaps in the fabric become filled. Hello, I can’t seem to find information about using the 3M 9332 while running (for 30-40 mins). Is it ok for breathing when running and is it still effective when wet due to sweat? I’ve heard that 3M N95 filters are useless when wet but don’t know about the 9332. Would you have information about this, thanks. Pingback: Does Poor Air Quality Mean Poor Performance? Great reviews and info, thank you. I just wanted to add that for me, whilst renovating a home with known lead dust, using a pair of sunglasses or spectacles is a great way to test whether a mask is air-tight around the nose seal. Inhale deeply and breathe out as hard as you can whilst wearing glasses and any leaks will cause condensation. For leaks around the sides and lower edge, holding your hand there whilst doing the above you’ll be able to feel if any air is leaking. Fitting any mask is the key to it working as best as it can (as the article states definitively) but I found this meant no signs of black dust in my nostrils and lungs despite working in extremely dusty conditions for weeks.